I think I like baseball. There. I said it. I'm not hiding it anymore. Most people know I am not in the sports fan club. There is however, more to my apathy for sports than just general loathing, and it doesn't diminish my genuine happiness for my friends who are fans. I always joke (the kind of joke thats true) that I love sports movies, but can’t stand the real thing. I watched the viral clip when Ishikawa hit the walk off home-run (and I learned a new term in the process) to clinch the pennant for the Giants. I’ve seen videos of Steve Perry leading the crowd in singing “Don’t Stop Believing”. This immediately released a wave of emotions both at watching the reaction of fans and the nostalgia it invoked in me. I spent last Thursday visiting with a friend in San Francisco. I was on muni at 4pm on my way back to CalTrain. The closer I got, the more I was surrounded by orange & black (and this brave man). I was excited for them all! I got off at the same stop, since AT&T park is just across the street from the train station. I paused to take it in: the buzz in the air and the sea of people united in their hopes that tonight might be the night. It was exciting. I even daydreamed for a moment how fun it would be as a fan, to go up to the city & watch the game in a sports bar near the stadium. (I guess other than my aversion to crowds and loud venues...but this is a short dream sequence, so go with me here.) Knowing they won that night made me happy for the team and for so many of my friends who were cheering them on. And if I really think about it, there was probably a small part of me that felt left out from the palpable, feverish joy in the Bay Area. For a long time I really have hated sports. We turn on the Superbowl, but I'm not kidding when I say it's more about the food and commercials than the game. (“we” being the kids & me. My husband actually likes to watch baseball and football, but gives it up to spend time with the family.) I mean in high school I was a cheerleader and we went to football and basketball games. I even did stats for baseball one season. I understood the games and enjoyed them. As an adult, my older boys played a year of Little League. I was team mom, my husband helped coach, and we all had fun. We actually encouraged other sporting opportunities that came along; soccer, wrestling, basketball, but they didn’t want to play. We didn’t push them to do what they weren’t interested in. As a family we didn’t watch games together, and I couldn’t understand the time people sunk into watching them. I moved to San Jose when I was four, from Los Angeles. My whole extended family & their friends are all from Southern California. Yes, Dodger territory. In elementary school, I liked the Dodgers, not because I ever really watched them, but because my dad liked them. 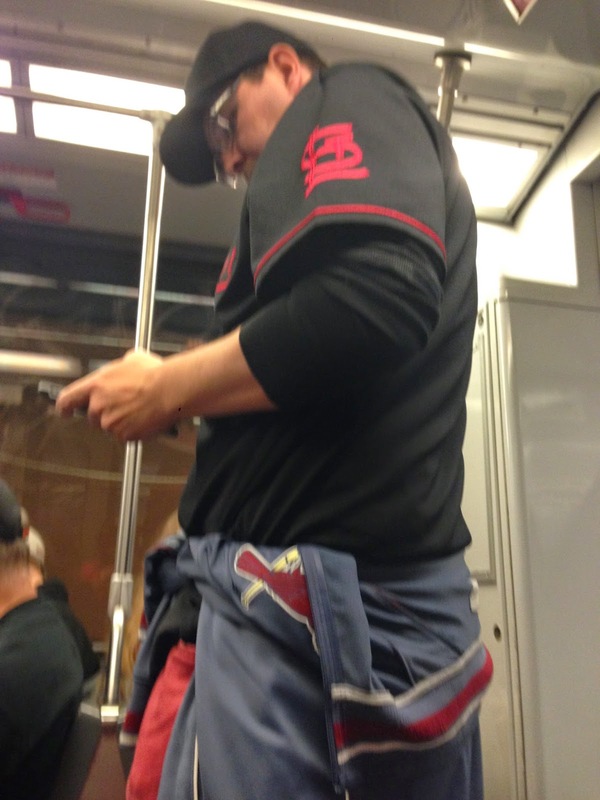 Of course, along with that was the unspoken rule that we hate the Giants. It didn’t really mean much to me though. Baseball in my life, and sports in general, consisted of my dad watching it on t.v. or going to an occasional game. We didn’t watch or cheer together as a family, and we didn’t go to games. It was his thing. As I look back, I now realize I saw sports as the thing that took my dad away from us so often. At least it felt often to me. Sure, as an adult I can see things differently. He was a great provider for us, faithful and responsible to our family and it was just something he enjoyed, but not something we all did together. When you’re a kid, at least for me, what I felt was that I was competing with the sports on t.v., and it was mostly either baseball or football. I’m sure that translated in to the attitude I have had as an adult. I decided to talk with some of my friends, women who are also Giants fans, about why they LOVE baseball. Most of them also included football in their responses. Overwhelmingly the common thread was that it was a family event. They grew up as fans and watched games together. They played catch as a family and they went to live games. There were strong, positive memories attached to it. It was part of their family traditions and heritage. Some also mentioned the fan camaraderie, the general thrill of the game and even the math involved in figuring stats, pitching & hitting trajectories, etc. As for the Giants in particular, they said over and over how they are classy, well-mannered, loyal and supportive. One of the women I asked is a teacher. She specifically mentioned that the positive attributes the team exhibits, makes them good role-models for her students. The qualities she wants them to emulate can be applied in their study of music and life in general. There was also the mention of admiring the “athletic build” by some, but that was definitely a bonus for them and not the sole reason they watched. I can totally see how these things would build in a love of the game, and love for a team, particularly when you are raised with it as such a big, positive part of your family. At one point, I thought maybe if we went to some professional games as a family, it would be a good chance for us to bond over the experience and could be a cool family event we could occasionally do. Maybe we could all get into it if we went to a few games...Then I saw the seat prices. Yowza! 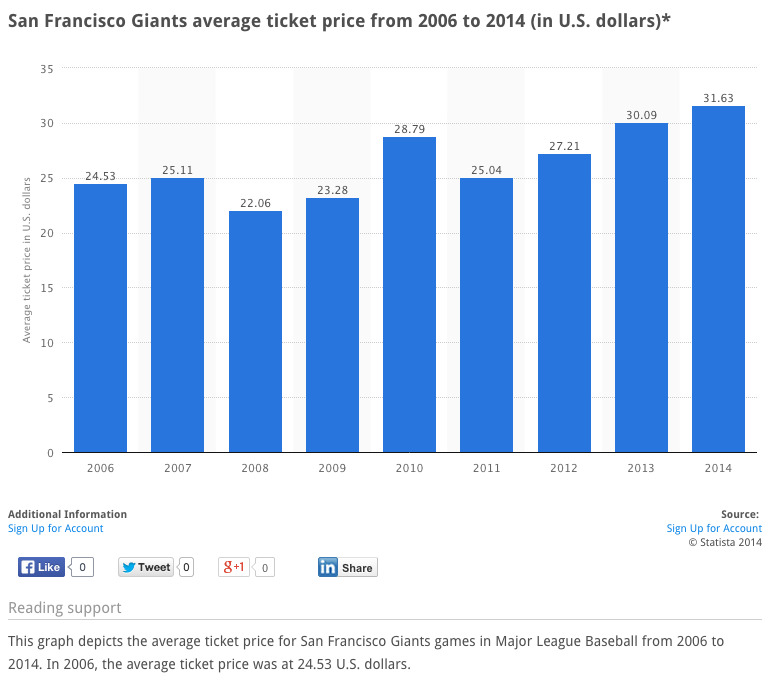 The Giants are in the top 25% of Major League teams with the highest average ticket prices, and prices have risen 29% over the past 6 years. Even to get two tickets at $32 each, the cost for that plus two round trip train rides ($36, which is a bargain compared to gas & parking) sets you back $106. One hundred six dollars! That’s without buying any food. For our family that would be $318 for one game, and just impossible. Manny Randhawa, a former writer for the Bleacher Report addressed this in a 2011 article. He writes how the Giants games are becoming more and more inaccessible to the “everyman” through market pricing (another term I learned) and the business of baseball. I knew it was expensive, and that surely played into my feelings, but I didn’t really know how expensive. When I looked at it, and I weighed the pros & cons, it just came up unbalanced. The expense, the investment of time that I always feel I’m lacking anyhow and the negative memories as a kid, have always tipped the scales heavier than the positive attributes can outweigh. For whatever reason though, I’ve felt a little swept up since sitting on Muni nine days ago. I followed the last half of the second game in the World Series. I actually turned on the radio to listen first as I was driving, and then finished watching it on tv when I came home. Ok, even that’s not totally accurate, which surprises me even more. TiVo was set to record and I couldn’t continue to watch live. (Let’s not go into our janky criss-cross wiring situation please.) 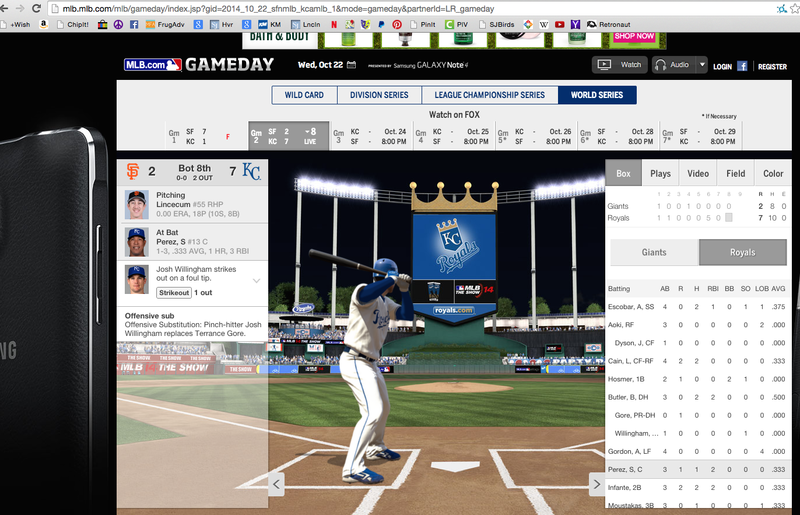 After returning home, they were in the 6th inning and I saw all the runs that put Kansas City ahead by five. I imagined their fans and the team’s families and how excited they must have felt to pull ahead so strongly. I felt bummed for the Giants and the Giants fans, and started to understand “it” even more. Once Tivo kicked in, I moved to the computer to follow the game. I thought I’d just get a scoreboard of some sort to update & follow. What I found was a whole simulated live streaming/updating/whatever online! While I don’t ever see myself becoming a die hard fan, or being able to watch the game at AT&T stadium, I am starting to wonder who the heck this lady is. 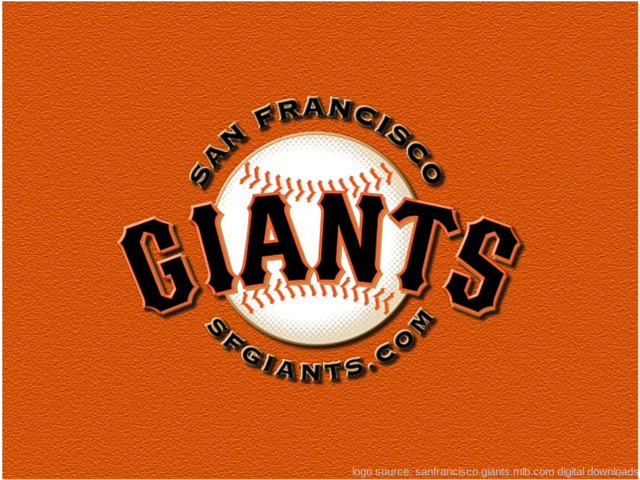 This kinda enjoying baseball, Giants-liking, radio listening, game watching lady. Who knows? Maybe we can foster a love of baseball into our family. And the biggest bonus on the “pro” side? They wear my favorite color. Gotta go!...the game’s about to start!